The Great Recession of the late 2000s and early 2010s shocked the core of many advanced economies. Few countries experienced its consequences as intensively as the southern economies of the euro area, such as Greece, Portugal, and Spain (Reis 2013, Bulow and Rogoff 2015, Santos 2017). International organisations like the IMF, the ECB, and the European Commission advocated for increasing the competitiveness of these economies (which were policy-constrained by sharing a common currency) through an ‘internal devaluation’ process, combining wage moderation with a set of structural reforms (most notably labour market reforms). This policy recommendation was expected to reduce unit labour costs, allowing southern European firms to lower their relative export prices and increase their market shares abroad (e.g. European Commission 2010). Merchandise exports in southern European economies demonstrated remarkable resilience during the Great Recession. Despite the severe domestic slumps in these economies, exports of goods quickly grew after the trade collapse of 2009. In the Spanish case, after falling by 11.5% in 2008-2009, merchandise exports grew by 30.7% between 2009 and 2013 (in real terms), compared to a real growth of 6.8% in the rest of the euro area for the period 2008-2013. 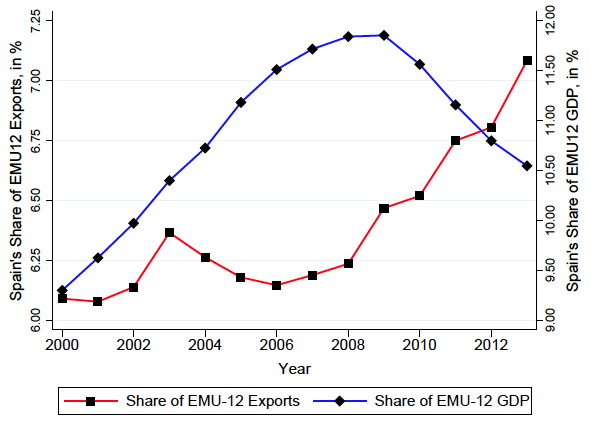 As a further illustration of the contribution of exports to mitigating the domestic slump in these economies, the share of euro area merchandise exports to non-euro area countries accounted for by these economies increased markedly during this period, despite the contemporaneous decline in the relative weight of these economies’ GDP in the euro area’s overall GDP. Figure 1 plots the share of exports to non-EU countries and GDP for Greece, Portugal, and Spain. 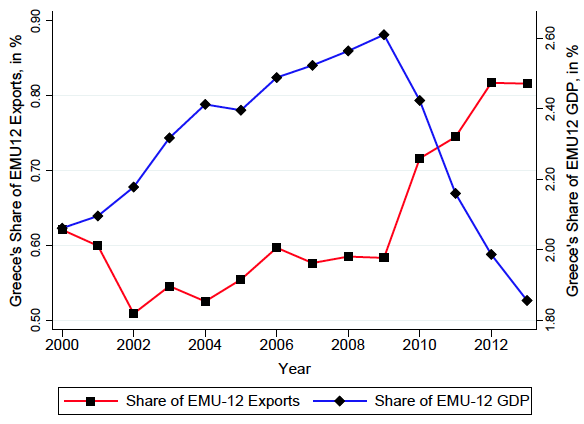 In all four cases, we observe a negative relationship between these countries’ GDP shares in the euro area and their shares in euro area goods exports to other countries. Data on merchandise exports and real GDP shares for the countries that belong to the EMU come from the AMECO Dataset (i.e. the European Commission’s Directorate General for Economic and Financial Affairs annual macroeconomic database). At first glance, this remarkable export performance appears to be consistent with the type of internal devaluation process advocated for by international organisations. Nevertheless, the adjustment in labour costs achieved via these policies in the manufacturing sector was modest up to 2013 (OECD 2018) and the internal devaluation channel had a limited contribution to export growth over the period 2010-2013 (e.g. IMF 2015, 2018, Salas 2018). So what explains the remarkable export growth in southern European economies over the period 2010-2013? 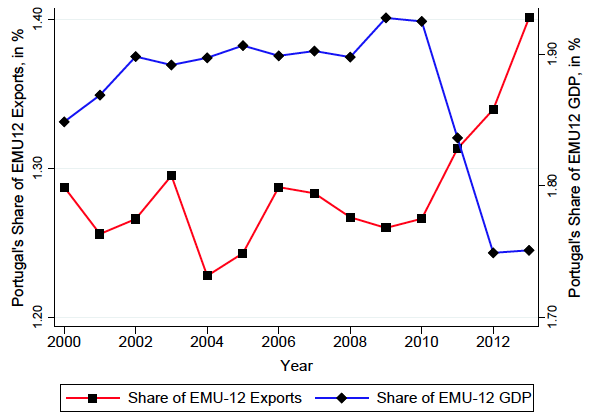 In a recent paper, we examine an alternative explanation that relates the growth in exports directly to the collapse in domestic demand for manufacturing exporters using the salient case of Spain (Almunia et al. 2018). We call this the ‘venting-out’ mechanism, which emerges from movements along firms’ cost curves induced by demand shocks. In particular, the mechanism arises when firms that face an unexpected demand-driven reduction in domestic sales have the ability to reduce their usage of flexible inputs (e.g. temporary workers and materials) relative to their usage of fixed inputs (e.g. physical capital and permanent workers). By freeing up capacity associated with irreversible investment inputs, firms achieve a short-run reduction in marginal costs that translates into a gain in competitiveness in foreign markets and, consequently, into an increase in firms’ exports. This alternative explanation resonates with the vent-for-surplus theory of the benefits of international trade, which has a long tradition in economics dating back to Adam Smith.1 However, the link between a domestic slump and export growth is hard to reconcile with modern workhorse models of international trade. The canonical model of firm-level trade à la Melitz (2003) predicts that firms’ domestic and export sales decisions can be studied independently from each other. Indeed, assuming that firms face constant marginal costs results in a zero effect of demand-driven changes in domestic sales on exports. In recent years, there has been an active literature showing that, in the presence of increasing marginal costs, there is a natural substitutability between domestic sales and exports (some supportive evidence is provided by Vannoorenberghe 2012, Blum et al. 2013, Soderbery 2014, and Ahn and McQuoid 2017). Our paper goes a step forward by attempting to identify and structurally interpret the causal effect of a domestic slump on exports, exploiting plausibly exogenous variation in domestic sales during a particularly salient event – namely, the Great Recession in Spain. We leverage Spanish firm-level data from 2002-2013 and geographic variation across Spanish regions in the reduction of domestic demand caused by the financial crisis to study the empirical relevance of the vent-for-surplus mechanism. To do so, we divide our sample into a ‘boom’ period (2002-2008) and a ‘bust’ period (2009-2013), and measure the extent to which, at the firm level, a decline in the domestic sales in the bust relative to the boom period is associated with an increase in export sales. When measuring this association, we control for ‘boom-to-bust’ changes in observed marginal cost shifters (i.e. measures of factor prices and productivity) to account for potential internal devaluation effects. We address the challenge of establishing a causal link between demand-driven changes in domestic sales and exports by exploiting rich geographic variation in the incidence of the Great Recession in Spain. This identification strategy is inspired by the influential work of Mian and Sufi (and collaborators) on the causes and consequences of the Great Recession in the US. In particular, we use the change in the municipality-level stock of vehicles per capita between 2002-2008 and 2009-2013 as a proxy for the extent to which the Great Recession affected demand across municipalities. We use a battery of empirical tests to show that local per capita changes in this major household durable consumption item is a valid instrument for the reduction in the domestic sales of firms located in different parts of Spain. The baseline results show that Spanish manufacturing exporters that faced a local demand-driven drop of domestic sales by 10% increased their exports by about 16%. This intensive-margin elasticity of exports with respect to domestic sales is consistent and robust even after controlling for sector and location fixed effects and for firm proxies of productivity and average labour costs. Note that this estimated elasticity does not imply a more-than-complete substitution of exports for domestic sales in monetary values. The median firm in the sample of continuing exporters has an export share of 16.5%, so revenue from domestic sales is around four times than revenue from exports. In that case, for every €100 of lost domestic sales, a firm with the median export share would be able to recoup €20 via exports. In the paper, we provide an exhaustive set of robustness tests to examine the credibility of the identification strategy and the estimated causal effects. These include excluding firms associated with the auto industry, heterogeneous effects, alternative instruments, controls for confounding factors, placebo tests and also alternative measures of productivity. We also explore whether the venting-out mechanism operates on the extensive margin, but we don't find evidence for that. This is consistent with the fact that more than 90% of the growth in Spanish exports in 2008-2013 is due to continuing exporters (De Lucio et al. 2017). Finally, we use a structurally estimated version of the model with a non-constant marginal cost of production to quantify the importance of the venting-out mechanism in explaining the 2009-2013 export miracle in Spain. Using our causal estimates as inputs for the structural model, we implement a variance decomposition exercise to determine the extent to which the domestic slump in Spain was driven by demand versus supply shocks. This decomposition allows us to calculate a counterfactual to predict the ‘boom-bust’ growth of exports that would be observed if there had been no change in the demand. The quantitative exercise detailed in the paper shows that approximately half of the growth in Spanish exports in the period 2009-2013 can be attributed to the venting-out mechanism created by firm-level responses to the slump in domestic demand. Larger exposure to external markets for sluggish economies has been an advised policy strategy to mitigate the effects of severe domestic slumps. In the specific case of a monetary union, international organisations’ standard policy recommendations to boost merchandise exports have relied mostly on achieving firms’ competitiveness gains through the decrease in their inputs prices (basically workers’ wages) combined with structural reforms to increase productivity. These policy recommendations are consistent with the insights raised from the standard models of international trade in which export and domestic sales decisions are not related at the firm level. Nevertheless, the short-run stickiness of wages, the medium-term returns of structural reforms, and the desirable synchronisation with financial and monetary policies create serious limitations for the success of internal devaluations when economies are in free fall. The recent export booms in southern European economies show that exports can have a broad scope to mitigate domestic slumps, even when internal devaluations are difficult to implement. New research suggests that interdependencies among domestic and external market conditions are relevant for manufacturers when they have the ability to reduce their usage of flexible inputs relative to their usage of fixed inputs. In the paradigmatic case of Spain, firms freed up fixed capacity associated with irreversible investment inputs, allowing exporters with a falling domestic demand to gain external competitiveness and thus increase their exposure to foreign markets where demand for their products existed. This evidence can rationalise the coexistence of exports booms during economic crises in economies in which internal devaluations had limited effectiveness in the short run. Authors’ note: Any views expressed in this column are only those of the authors and should not be attributed to the Banco de España or the Eurosystem. Ahn, J B, and A F McQuoid (2017), “Capacity Constrained Exporters: Identifying Increasing Marginal Cost”, Economic Inquiry, 55 (3), 1175-1191. Almunia, M, P Antràs, D Lopez-Rodriguez, and E Morales (2018), “Venting Out: Exports during a Domestic Slump”, CEPR Discussion Paper 13380. Blum, B S, S Claro, and I J Horstmann (2013), “Occasional and Perennial Exporters.” Journal of International Economics, 90 (1), 65-74. Bulow, J, and K Rogoff (2015), “The modern Greek tragedy”, VoxEU.org, 10 June. De Lucio, J, R Mínguez, A Minondo, and F Requena (2017), “Los Márgenes del Crecimiento de las Exportaciones Españolas Antes y Después de la Gran Recesión”, Estudios de Economía Aplicada, 35 (1), 43-62. European Commission (2010), “Quarterly report on the euro area”, Directorate General for Economic and Financial Affairs, March. Fan, H, Y Liu, L Qiu, and X Zhao (2018), “Export to Elude”, mimeo, University of Hong Kong. International Monetary Fund (2015), Crisis Program Review. International Monetary Fund (2018). “Spain”, IMF Country Report no. 18/330. Melitz, M J (2003), “The Impact of Trade on Intra-Industry Reallocations and Aggregate Industry Productivity”, Econometrica, 71 (6), 1695-1725. Mian, A, K Rao, and A Suﬁ (2013), “Household Balance Sheets, Consumption, and the Economic Slump”. Quarterly Journal of Economics, 128 (4), 1687-1726. OECD (2018), “Productivity and ULC by main economic activity (ISIC Rev.4)”, OECD Productivity Database, OECD Online Databases. Reis, R (2013), "The Portuguese Slump and Crash and the Euro Crisis," Brookings Papers on Economic Activity, 46 (1), 143-210. Salas, J (2018), “Drivers of Spain’s Export Performance and the Role of Labor Market Reforms”, IMF Working Paper. Santos, T (2017), “El Diluvio: The Spanish Banking Crisis, 2008–2012”, mimeo., Columbia Business School. Smith, A (1776), The Wealth of Nations, Book II, Chapter V.
Soderbery, A (2014), “Market Size, Structure, and Access: Trade with Capacity Constraints”, European Economic Review, 70, 276-298. Vannoorenberghe, G (2012), “Firm-level Volatility and Exports”, Journal of International Economics, 86 (1), 57-67. Smith (1776) writes “When the produce of any particular branch of industry exceeds what the demand of the country requires, the surplus must be sent abroad, and exchanged for something for which there is a demand at home. Without such exportation, a part of the productive labour of the country must cease, and the value of its annual produce diminish". The term “vent-for-surplus" was introduced by John Stuart Mill in his Principles of Political Economy (1848).